Certain conversations in healthcare, or in life generally, are difficult. Death has come to be an event I can expect again myself, personally, having had a cardiac arrest myself in 2007. From that time, I believe that anything can happen at any time. An unfortunate conclusion I drew from my time in medicine was that nasty things happened to nice people. Receiving a formal diagnosis of dementia, as Richard Taylor, living with dementia, says, does not bring you any closer to the day when you would have died. 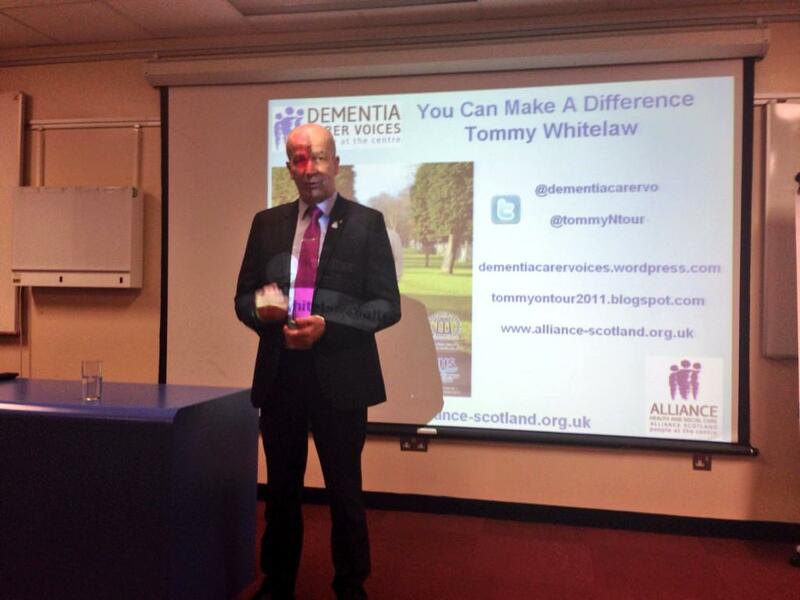 The change in emphasis to ‘living well with dementia’ is partly to get round the notion of preparing for death. Likewise, residential care settings can be unappealing for some, taking on the aura of a departure lounge for the journey ending ultimately in death. Dementia poses particular issues for end of life planning, and the general impression in policy that these issues have been generally under-addressed thus far. The recently published ‘Prime Minister Dementia Vision 2020‘ even included a section on it. We know that dementia is a progressive condition, but it is not always easy for care staff and family carers to tell when the end of life is approaching. A lack of understanding about dementia has been identified as a barrier to providing excellent end-of-life care for people with dementia. You can of course attempt to do something about this, as indeed the recent Government initiatives have tried through workforce training initiatives, and giving information sessions for the general public through ‘Dementia Friends’. Specifically, there is also a lack of research on the training of care staff to recognise and respond to the need for palliative care. the use of comfort. This means that people with dementia sometimes do not receive the end of life care they would have ideally wanted. The waiting for death component as an inevitability is bound to cause stress, but it is hoped that this inevitability of death will not deter individuals living with dementia from trying to lead lives post diagnosis. Often, people who have received a diagnosis of dementia find themselves totally unsupported. The natural course of the dementias can often be rather protracted and all too unpredictable, with progressive physical and cognitive losses typically over many months and years. The nature of disease progression makes death at home relatively rare, and death in a specialist palliative care institution or hospice particularly rare. 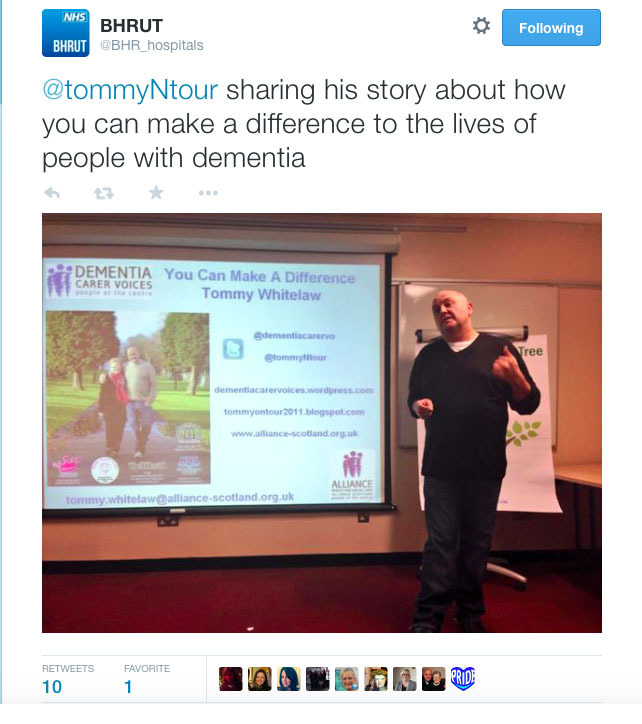 The number of people living and dying with dementia is increasing. The proportion of people with dementia will increase rapidly during the coming decades, and end-of-life practices in dementia care concern a significant number of old people and care professionals worldwide. Person centred approaches to dementia care assumes that people with dementia can actively participate in decisions about their lives, and this is generally consistent with what policy is trying to aim for folllowing diagnosis: a person-centred approach. It is a generally accepted belief that people wish to die peacefully. Nevertheless, literature on ‘dying peacefully’ is rather limited and a bit noncommittal. The concept of ‘dying peacefully’ is broad, and it is often referred to as ‘tranquillity’, which may be connected to various aspects of emotional and spiritual well-being, such as feeling close to loved ones and feeling deep inner harmony. Providing quality end-of-life care for individuals in residential care settings with dementia is a growing concern. The statistics are actually quite staggering. In some countries, one-third to one-half of people with dementia live in residential or nursing homes. Three-quarters (76%) of all deaths occur in hospitals in Japan, probably the highest proportion in the world. In contrast, only 4% occur in nursing homes. But this generally is not that representative. Across Europe, most people die at an older age, which makes listening to their preferences regarding care, treatment and place of care and death especially important. A shift from hospital to care home deaths has been observed in Belgium and the Netherlands from 1998 to 2007, especially for patients with dementia. Dying is part of care home life, and an important aspect of the overall quality of care provided. Here at home, both service provision and research tend to consider care homes as unique environments for the elderly. We do not know whether individuals with young onset dementia feel comfortable being in residential care settings with much older inhabitants; it would be dangerous to make assumptions here as elsewhere in policy. Dying is not an unexpected outcome following a move into a care home, although often not acknowledged at the time of entry. In the UK, the generic term ‘care home’ encompasses the provision of two types of care: nursing care and/or personal care. Care homes for older adults are an important setting for end-of-life care provision. In the UK there are an estimated 15,700 care homes providing nursing care and/or personal care to more than 400,000 older people with a range of different needs in England and Wales. In fact, the majority of deaths of people with dementia occur in institutional settings such as care homes and hospitals, where unmet needs and concerns about care quality appear most pervasive. Residential and nursing care homes, along with other long-term care settings have increasingly become places where people spend the final stages of their lives. Care homes are the place of abode until their death for many older people, and how older people die in this care setting raises particular challenges. An understanding of where people die is essential to develop health policies aimed at improving end of life care. In addition, place of death can be an important indicator of the quality of end of life care. National policy is clear that people should receive good end-of-life care irrespective of the condition with which they die, yet evidence suggests that people with dementia and their families receive poor-quality care in the final stages of their lives. The place of death has also been recommended as a quality indicator of palliative care; in the UK death in the usual place of residence (which may be a care home) is a “key performance indicator” for those providing end of life care. However, remaining in a familiar care environment is not always possible, and end-of-life care transitions, particularly transfers from long-term care facilities to hospitals, are common in this patient group. According to the General Medical Council (GMC), the regulator of doctors, people are approaching the end of their life when they are likely to die within 12 months. Advance care planning aims to discuss and prepare care choices for the stage in life when people no longer have the capacity to make decisions. When a person moves into a care home, there should be opportunities to discuss advance care plans sensitively at a carefully chosen time or when the moment arises. However, it is also important to respect the wishes of people who do not want to specify in advance what end of life care they wish to receive. In summary, advance care plans, or similar expressions of views, are important ways in which people with dementia can express their wishes about end of life care. Currently it is arguable that not enough is known about how to implement these wishes effectively, especially where there is disagreement between a person’s advance care wishes and the views of family members or professionals. To date, research has largely focused on describing the experience of patients with advanced dementia and the care they receive. This work has delineated abundant opportunities for improvement. Addressing those opportunities must be the overarching objective for advanced dementia research in the coming decade. 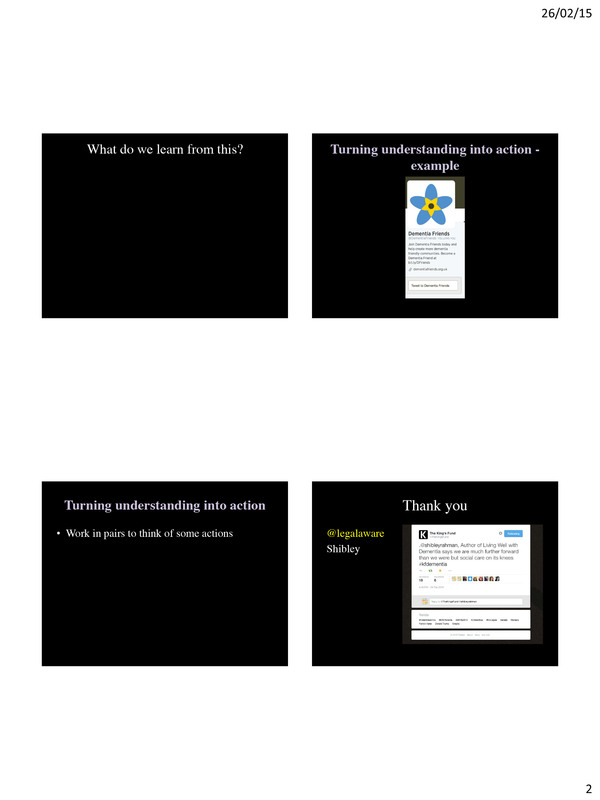 So, end of life care for people living with dementia is potentially complex, but does demand our attention. Whether you’re a politician, a person living with dementia, or a caregiver, or someone completely different, not talking about the complexities won’t make the issues go away. Is this dress black and blue or gold and white? The background colour of daylight varies during the time of day. That colour axis varies from the pinkish red of dawn, up through the blue-white of noontime, and then back down to reddish twilight. People who see white and gold may be looking at the dress in a blue-lit room or near a window with a blue sky. It also depends on our own individual sensitivity to the bluish tinting in the photo. 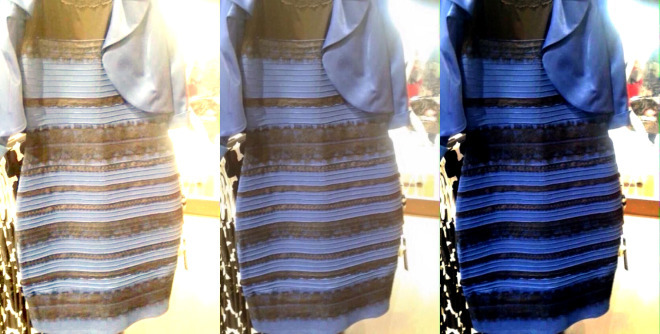 The brains of people who see white and gold are interpreting the photo as more shadowy. The brain compensates for the darker blue tinting and interprets the blue part as white and the black part as gold. So we all do see the dress differently. This phenomenon is known as “colour constancy”. Colour constancy is an example of subjective constancy and a feature of the human colour perception system which ensures that the perceived colour of objects remains relatively constant under varying illumination conditions. A green apple for instance looks green to us at midday, when the main illumination is white sunlight, and also at sunset, when the main illumination is red. We don’t want the colour of objects appearing to change as the day progresses? The physiological basis for colour constancy is thought to involve specialised neurones in the primary visual cortex that compute local ratios of cone activity. Colour constancy works only if the incident illumination contains a range of wavelengths. The different cone cells of the eye register different but overlapping ranges of wavelengths of the light reflected by every object in the scene. From this information, the visual system attempts to determine the approximate composition of the illuminating light. This illumination is then discounted in order to obtain the object’s “true colour” or reflectance: the wavelengths of light the object reflects. This reflectance then largely determines the perceived colour. 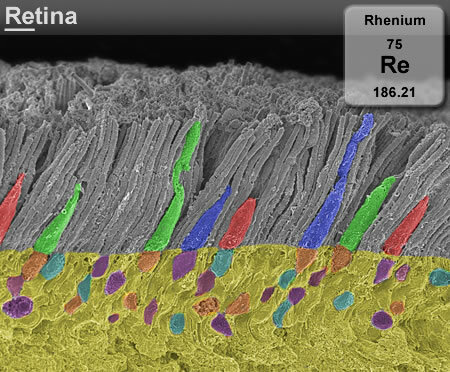 These cone cells are the colour-sensitive cells of the retina (comparable to the “film” in a camera). The non-colour sensitive cells are called rods. This is what a cone looks like under a microscope. The same phenomenon underlies the “Mondrian panel” – where the colour of a square depends on the colour of the squares around it. Pieter Cornelis “Piet” Mondriaan (March 7, 1872 – February 1, 1944), was a Dutch painter. He was an important contributor to the De Stijl art movement and group, which was founded by Theo van Doesburg. He evolved a non-representational form which he termed neoplasticism. This consisted of white ground, upon which was painted a grid of vertical and horizontal black lines and the three primary colours. And central processing of colour is not thought to be affected early on in the dementia of the Alzheimer type, as the memory part of the brain (hippocampus) is in a different part of the brain involved in processing colour (the occipital part of the brain). That’s why we do desperately need some evidence-based neuroscience looking at colour in so called “dementia friendly communities”, otherwise the field will be riddled with speculation, anecdote and rumour. Posterior cortical atrophy (PCA) is different. 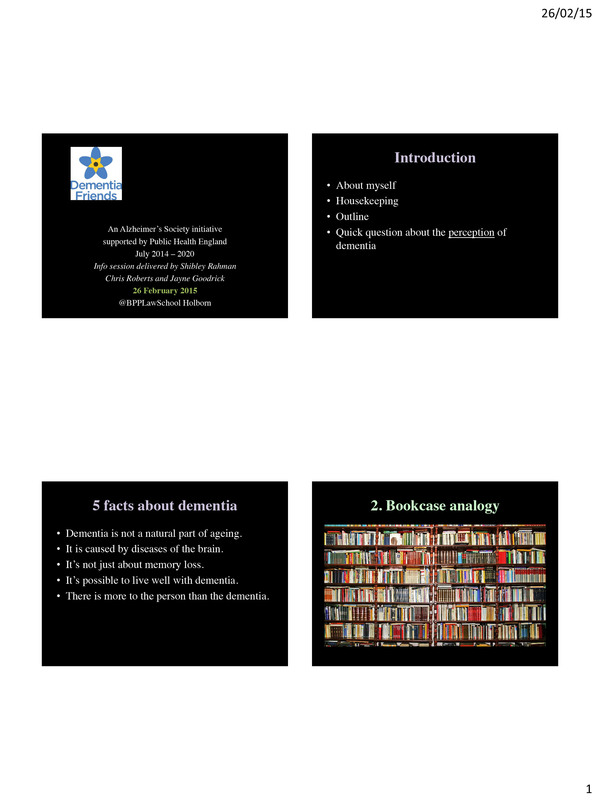 In “Dementia Friends”, we are told that dementia is not just about losing your memory – indeed in early PCA the common presenting problem can be that of visual perception rather than memory. It’s not uncommon for people with this form of dementia to go round the houses seeing opticians rather the memory clinic/cognitive disorders clinic. 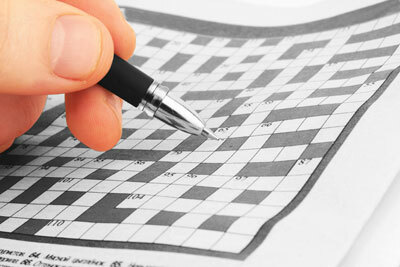 However, there are specific dementia syndromes which can conceivably affect that part of the brain. Chan, Crutch and Warrington (2001) reported an intriguing 64 year old woman with posterior cortical atrophy. Her presenting symptom was of seeing objects as abnormally coloured after prior exposure to a coloured stimulus. Formal testing disclosed that the patient experienced colour after-images of abnormal latency, duration, and amplitude. 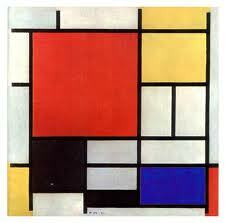 Indeed the description of the methods in the paper makes reference to Mondrian panels. A general theme is that living better with dementia is the result of an exquisite interaction between the facets of a person (personhood) and the wider environment at large. It would be low hanging fruit to see if a population of people living well with posterior cortical atrophy see the dress differently to people in the general population. We know we tend to see that dress differently, but are the ratios of the black/blue – gold/white different in people living well with posterior cortical atrophy? Elder abuse, the mistreatment of older people, affects over 100,000 older adults each year in the United Kingdom. The global prevalence of elder abuse is unknown as underreporting is estimated to be as high as 80%. Approximately half of abuse violations are ‘serious enough to cause actual harm to the residents or to place them in immediate jeopardy of death or serious injury’. Protecting the rights of residents of long-term care services has become a high profile policy goal within the UK and internationally, thereby confirming elder abuse’s current status as a social problem. Common to many definitions, this has an individualistic focus, in which abuse is seen as primarily, if not exclusively, an interpersonal phenomenon. This definition is also typical in that it excludes crimes committed by strangers and structural issues, such as poverty and the possible impact of ageism. Ageism appears to be a widespread phenomenon in many domains of life and is known to be prevalent in health care. Ageism relates to the systematic discrimination of older persons, viewing them as senile, a burden, useless, and invisible. Ageism can be expressed on three levels: the individual (micro) level, the institutional level, and the societal (macro) level. Not all people who are old have dementia, and not all people living with dementia are old; but there is concern about the group of older citizens living with certain severity of dementia. Some people with dementia may be at particular risk of elder abuse. Several theories have been proposed to explain the onset of elder abuse. Social learning of abusive behaviours, caregiver stress, social isolation of the victim, dependency between the victim and the abuser, and psychopathology of the abuser are commonly accepted theories. Elder abuse may be domestic, taking place in the home of the abused or in the home of a caregiver, or it may be institutional, taking place in a residential facility for the elderly (eg, a nursing home). Elder abuse may be intentional (active) or unintentional (passive). Nurses are among the first professional workers to encounter the older persons who arrive at the long-term care facility. They are therefore positioned on the front line to detect abuse and neglect and are also in a position to prevent it. Neglect implies withholding of expected levels of comfort, e.g., withholding food or medications. Abuse may take several forms. Physical abuse encompasses a wide range of abuse, including striking, pushing, shoving, choking, burning of skin and other forms of physical injury. Psychological or emotional abuse may be subtle but includes withholding of funds, food, medications, isolation, belittling or ignoring of elders, and other forms of non-physical abuse. Financial abuse is fairly frequent, inasmuch as family members and others may restrict access of elder persons to much needed funding that they may be entitled to receive. This may include confiscation of pensions, annuity funds, social security checks or personal savings. •	to make sure that care is centred on people’s needs and protects their rights. Care that fails to meet the expected national standards of quality and safety is supposed to be intolerable under implementation of existent law and regulation. Some form of surveillance is critical to ensure people are receiving safe, high-quality and compassionate care. We need enough staff, properly trained and supported who really care to ensure people get the services they have every right to expect. The term ‘safeguarding’ can be defined so as to describe a range of activities that organisations should have in place to protect people (both children and adults, unless stated otherwise) whose circumstances make them particularly vulnerable to abuse, neglect or harm. There has been recent scrutiny of surveillance techniques in preventing or acting upon neglect or abuse in care homes. Adult safeguarding is the process of protecting adults with care and support needs from abuse or neglect. It is an important part of what many public services do, but the key responsibility is with local authorities in partnership with the police and the NHS. The Care Act 2014 puts adult safeguarding on a legal footing and from April 2015 each local authority must make enquiries, or ensure others do so, if it believes an adult is subject to, or at risk of, abuse or neglect. An enquiry should establish whether any action needs to be taken to stop or prevent abuse or neglect, and if so, by whom. It was announced recently in the lifetime of this government that a new offence of ‘wilful neglect or mistreatment’ is to be created for NHS hospital staff whose conduct amounts to the deliberate or reckless mistreatment of patients. This offence will be modeled on an existing offence under the Mental Capacity Act which punishes the wilful neglect or ill-treatment of patients lacking capacity. Currently, a medical worker convicted of this offence faces a maximum sentence of five years imprisonment, or an unlimited fine. The sanctions for the proposed new offence are likely to be of a similar severity. The creation of the offence comes in the wake of the inquiry into the widespread negligence that occurred at Mid Staffs. Intended principally to deter healthcare workers from mistreating patients, the new offence has been proposed following review of patient safety. The leader of the review, Professor Don Berwick, emphasised that patient safety must become the top priority, consistent with the statutory purpose of the clinical regulators, and that the measure was needed to target the worst cases of an attitude that led to ‘wilful or reckless neglect or mistreatment’. The measure in the construct of our and EU law has to necessary and proportionate in implementation. Whilst most would agree that patient safety should be a priority, there has been concern that the new criminal sanction could create a ‘climate of fear’ amongst healthcare workers and that individual workers will be penalised for mistakes pursuant to inadequate staffing or simple human error, rather than blameworthy acts of intentional malice. An understudied issue is abuse among older adults living in nursing homes, often referred to as resident-to-resident aggression (RRA). Although the term ‘‘elder mistreatment’’ in the context of nursing home care invariably evokes images of resident abuse by staff, resident-to-resident aggression (RRA) may be a much more-prevalent and problematic phenomenon. Cognitive impairment afflicts a huge proportion of nursing home residents in many jurisdictions, often leading to behavioural disturbances including agitation and overt aggression. Behavioural disturbances are a well-known risk factor for nursing home placement. It is likely that collocating nursing home residents with behavioural disturbances increases the potential for RRA. Finally, elder abuse and neglect continues to be a growing and often unrecognised problem in many jurisdictions including the UK. At their best, assisted living facilities hold the promise to maximise the dignity, privacy, and independence of their residents. The opportunity for residents to “age in place” with the availability of increased services allows for a highly variable range of residents to coexist in assisted living. Specifically, the presence of cognitive impairment in conjunction with minimal regulations and oversight, private rooms, low staff ratios, minimal staff training, and high staff turnover may conspire to increase risk. Activity has therefore been recommended for people with dementia as a means of retaining human abilities and function,by maintaining their connection with the environment and encouraging social interaction. It has, unsurprisingly, been recommended that, in the middle to late stages of the disease, the activities should focus on fine- and gross-motor and sensory activities. Consistent with this recommendation, there are currently two main approaches with promising results in people with moderate to severe dementia: multi sensory stimulation and motor stimulation. Alive! is a charity dedicated to improving the quality of life for older people in care by enabling their participation in meaningful activity. They run hour-long activity sessions for older people in over 350 care homes and day centres across the South and South West of England. They also run one-to-one sessions for individuals who are not able to join in with a group Their sessions are designed to be effective for people living with Alzheimer’s disease and other forms of dementia, physical disabilities, neurodegenerative illnesses such as Parkinson’s disease, learning difficulties and mental disorders. In one event, “Our Paint Pals” created a piece of art under the theme ‘It’s our world’ and showed how being creative can bring the generations together. Martin Bromiley has been instrumental in describing this “fixation problem“. Bromiley’s case, of failed anaesthesia in a critical situation, was described in a 2010 paper in the journal Anaesthesia which looks at the fixation problem with an experimental analogy. It has repercussions for patient safety in the contemporary NHS. Consider the following “cheap necklace problem”. Your aim is to make a necklace that costs no more than 15 cents using the four chains below. It costs two cents to open a link and three cents to close it again. If you are struggling to solve this problem then you’re not alone – 97% fail to solve the cheap necklace problem. To solve the cheap necklace problem we must break the links in one of the chains, costing us six cents and use these three links to join the remaining chains. It turns out that over 90% of adults can’t solve this problem successfully – as they become fixated on the impossibility of it. In dementia policy, the gaming of the ‘ambition’ for diagnostic rates has become much more significant that the value of the diagnostic rates themselves. Calling them ‘ambitions’ rather than ‘targets’ is a vacuous exercise of meaningless circumstance. Through a change in algorithm, a GP practice can have wildly different rates of diagnosing dementias from one year to the next. And policy should rightly approach this issue with fear – when human mortality standardised ratios were gamed it led to real problems. In the Australian jurisdiction, certain institutions were alleged to respond to an unfavourable HSMR by “gaming” administrative data and risk-adjustment models or implementing inappropriate changes to care. And it became relevant to Mid Staffs too. The national pressure to make diagnostic rates appear better plays scant disregard to the actual epidemiological data from the MRC CFAS work to show that the prevalence of dementias in England has in fact been falling. Also, the appearance of a greater number of dementias being diagnosed in primary care bears little or no relation to the ability of GPs to diagnose certain young onset dementias, for example the behavioural variant of frontotemporal dementia where insidious personality change is the presenting symptom not problems in short-term memory. If you’re not worried about this situation, you should be. Dr Martin Brunet in an excellent talk yesterday at the King’s Fund in a satellite session on diagnostic rates brought the audience’s attention to the “cobra effect”, which stems from an anecdote set at the time of British rule of colonial India. The then British government was concerned about the number of venomous cobra snakes in Delhi. It therefore offered a lucrative bounty for every dead cobra. Initially this was a successful strategy as large numbers of snakes were killed for the reward. Eventually, however, “enterprising” persons, ‘doing things differently’, began to breed cobras for the income. When the government became aware of this, the reward program was scrapped, causing the cobra breeders to set the now-worthless snakes free. As a result, the wild cobra population further increased. The apparent solution for the problem had no effect on the underlying problem; arguably it in fact made the situation ultimately far worse. The rather-sensationally labelled “cash for diagnoses scandal”, with GP practices being paid handsome incentives for dementia-related work, was viewed by many to be a low-point in QOF overplaying their hand in England: “an ethical travesty“. In my discussion at this satellite session for the King’s Fund, I argued that this fixation problem in English policy is a significant issue. It is setting patients with dementia up for a fall; in gaming the diagnostic rates, perhaps as a result of political pressure from the current Government prevents one from moving onto the other, at least as important, issue of post-diagnostic support. Later in the panel discussion, Beth Britton, leading campaigner in dementia issues, called it a “black hole” of post-diagnostic support currently. There was a strong consensus from the audience members of our Q+A session today that it was intolerable that social care was on its knees, with social care poorly funded, care home standards for people with dementia often quite inadequate. Even though this is a historic problem, it appears not to be fixed by the current focus on ‘dementia friendly communities’ or diagnostic rates. But it is a pressing issue, and one of massive societal significance. It is also, significantly, an issue of resource allocation. The ‘zero sum gain’ of more money being put into practices which can successfully game targets at the expense of money being put into an adequate social care is a very real one, but these funding inequities will take longer than one term of government to solve. 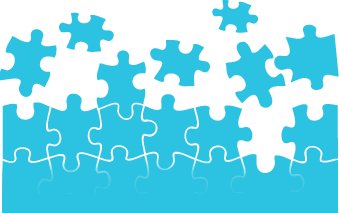 Possible approaches for ‘beefing up’ post diagnostic support or care might include dementia advisers, clinical nursing specialists, an enhanced social care practitioner workforce, or care coordination. A redistribution of allocations must take place, and integrated, whole person care, is unsurprisingly therefore a top priority now, even though everyone has been talking about it for ages. Person-centred care's focus shouldn't be profit generation. But it does deserve attention in dementia. The complexity of dementia demands comprehensive individualised care that addresses physical, psychological, social, and legal issues of the persons with dementia as well as their caregivers Recently, person-centred care (PCC) has become valued in the field of dementia care. Nonetheless, PCC has been considered to be rather abstract or vague, partly as many publications are based on personal opinion, anecdotal evidence and/or theoretical constructs only. Person-centred care is increasingly considered essential, whereas purpose-built facilities and environmental design are reported to enhance safety and to have a positive effect on behaviour. Within the UK National Health Service (NHS), the provision of person-centred services for individuals with acquired neurological conditions has been widely promoted. 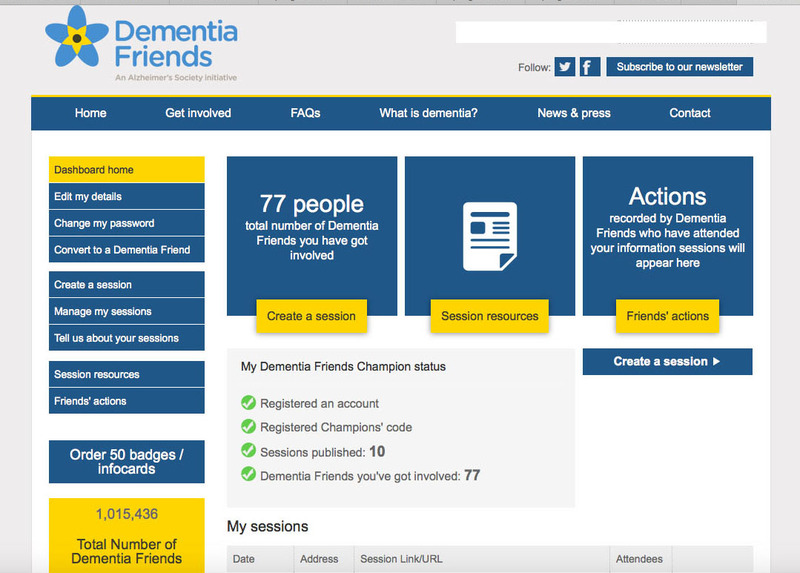 Services provided for people with dementia have been criticised in reports such as the UK Audit Commission’s ‘Forget-Me-Not’ which found them inflexible rather than person-centred, with poor integration of health and social services (Audit Commission, 2000). To inform and direct service development for this clinical population, the National Service Framework for Long Term Neurological Conditions (Department of Health, 2005) originally set out quality requirements for improving PCC. PCC in rehabilitation has been defined as an approach that facilitates participation in decision making and goal-setting, client-centred education, client evaluation of outcomes, family involvement, emotional support, physical comfort, co-ordination and continuity. Ideas about person-centred caregiving have been discussed by several authors within the gerontology literature. In the United Kingdom and elsewhere, Kitwood’s work with residents with dementia has been influential (Kitwood, 1997). This approach reconceptualises the dementias as involving processes not focused on pathology but on the social psychology of the person affected. An individual’s characteristics, including such things as the past, roles, personality, values, self-worth, spirituality, and so on, combined and defined through years of living, are often used to identify personhood at a higher level. Kitwood’s research places an emphasis on the belief that older adults should be treated as social beings worthy of relationship. Within each human being, regardless of cognitive impairments, is the desire to be respected and connected with others. As recent research investigations in nursing homes have emphasised, the personal relationships direct care workers forge with individual residents appear central to quality of care or quality of life outcomes on the part of residents. Evidence for improved outcomes for people with dementia through provision of person-centred care and dementia-care mapping thus far has been largely observational. However, taking a more robust scientific approach (it is mooted), person-centred care and dementia-care mapping both seem to reduce agitation in people with dementia in residential care. There has been – on the whole – a welcome recognition of the importance of a well-trained workforce to support people with dementia living in care homes. However, there is an emerging between the interventions that are routinely available and being commissioned, and the evidence base indicating benefit, arguably. In a way, person-centred care and family centred-care are not especially different what excellent caregivers, including professionals, should have been doing. Whilst nobody ‘owns’ the agenda, it would be a real shame if the marketing and corporatism o this ideology overplayed their hands at the expense of their clinical underpinnings. Audit Commission. Forget Me Not: Mental Health Services for Older People. London: Audit Commission, 2000. Department of Health (2012b). 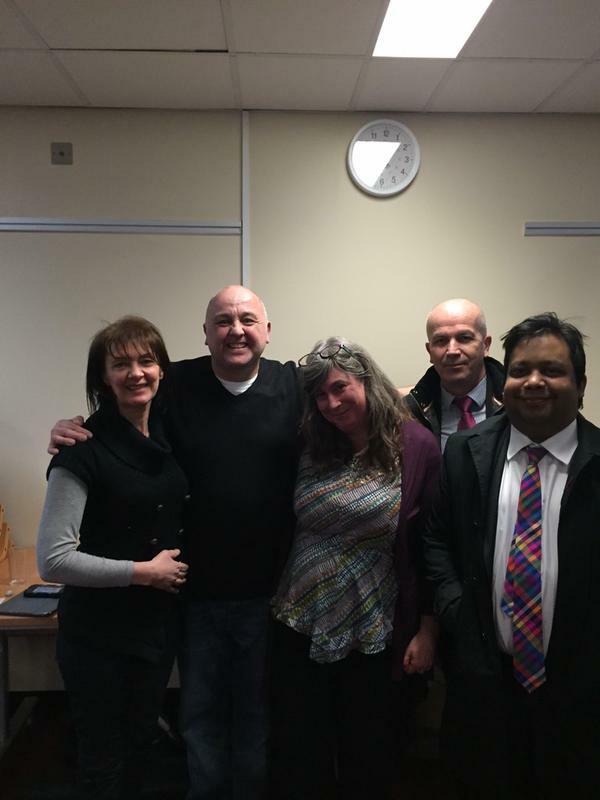 Compassion in practice: Nursing, midwifery and care staff. Our vision and strategy. London: Department of Health. Kitwood, T. (1997). The experience of dementia. Aging & Mental Health, 1, 13–22.